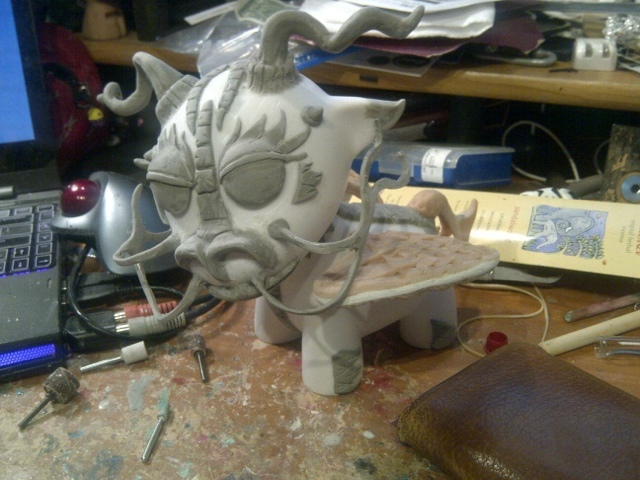 A work in progress shot of Scott Kinnebrew's second custom 7" Raffy: this one is a dragon! 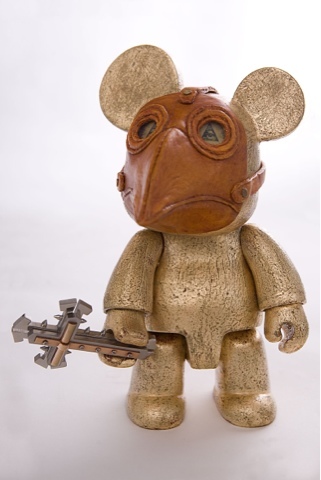 Renowned Urban artist Jorge Rodriguez Gerada has created an amazing "Plague Doctor" Qee bear for the Swab Art Fair AIDS charity project. Swab Barcelona 2012 presents the AIDS charity project, Swab Toy’z for FLS, hand in hand with the Lluita Contra la Sida Foundation Fighting Aids, and the participation of about 100 artists and designers who have made artistic interventions on 8" white QEE’s, turning each one into a unique and exclusive piece. 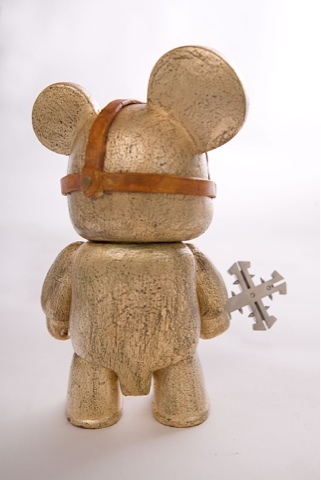 There will be an exhibition of the customized Toys during the days of Swab Barcelona 2012 (23-26 May), along with a catalog that will document each of those sold in the auctions organized by Swab Barcelona 2012. This publication will undoubtedly contribute on the spreading of the project on the international art world. Furthermore, to enhance its dissemination, a selection of Toys will be exhibited in several European Art Fairs. Participation in this project becomes a unique opportunity for artists and designers to show their work by contributing to this act of solidarity. 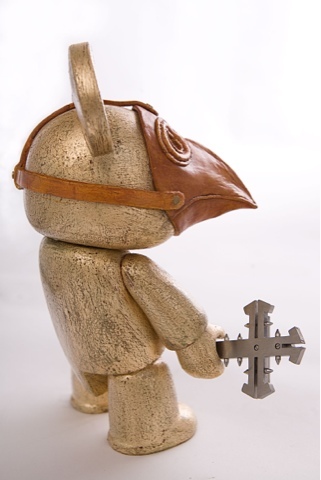 The project is curated by the architect, collector and expert in the international Art Toys, Juan Redón. The 80 Qee’s will be sold online on the Swab Barcelona website and 20 will be sold at the presencial auction organized by SOTHEBY’S on Thursday 24th at 19.30 at the Fair. The benefits of the auction will be destined entirely to the Lluita Contra la Sida Foundation Fighting Aids (FLS), a non-profit organisation whose core missions are healthcare, research and teaching in the field of HIV infection. The Foundation has its own HIV unit in the Germans Trias i Pujol Hospital in Badalona (Barcelona), an international medical reference in their research on the disease. 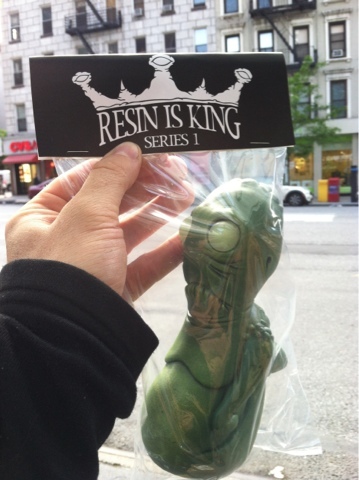 The Golden Ticket prize for our upcoming Resin is King Series 1 has arrived- a custom painted Teuth by Brian Ahlbeck! Staying true to the nature of resin toys, every single one of the 40 pieces in this series is absolutely unique. 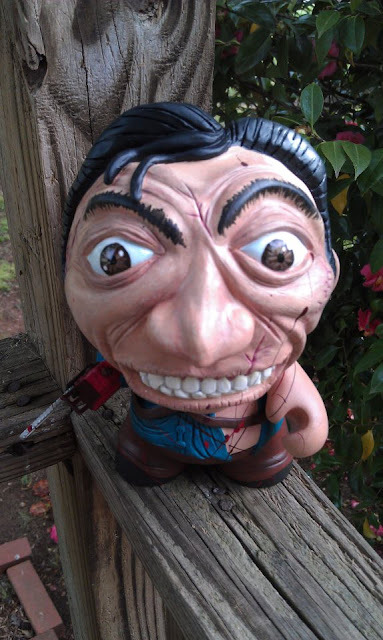 Each artist created a new sculpt specifically for this series, but after they cast the pieces in resin, each one is hand-painted or embellished by the artist to make it unique. 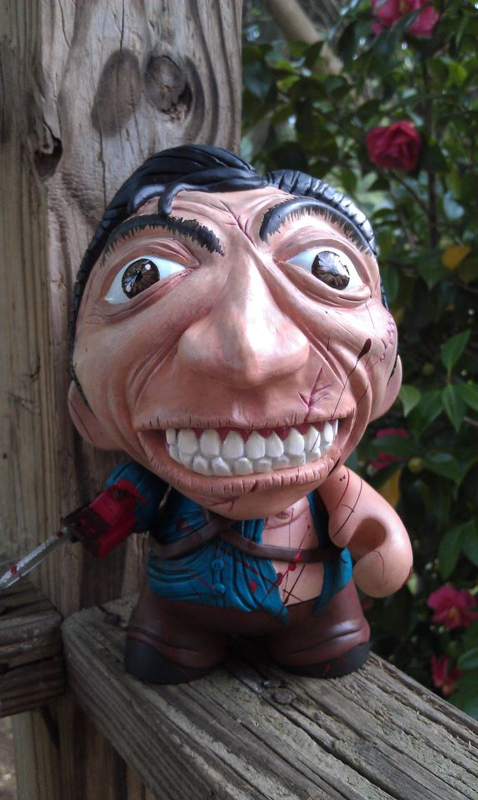 Each sculpt comes in at just under 3 inches tall. 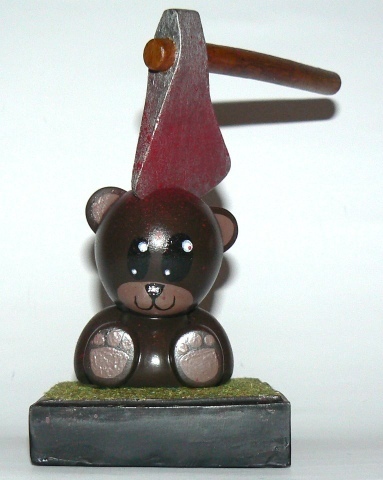 Each blind box will contain a randomly-packed resin figure, a ratio card and a sticker. Brian Ahlbeck has created a Teuth as a Golden Ticket (below). The Golden Ticket will be randomly inserted into one of the blind boxes. The winner need only contact us according to the instructions on the ticket. 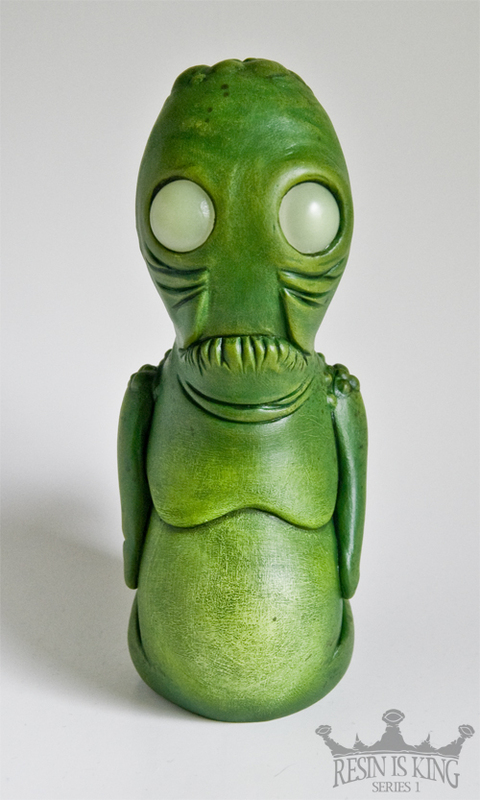 The Golden Ticket prize: this custom-painted Teuth by Brian Ahlbeck! 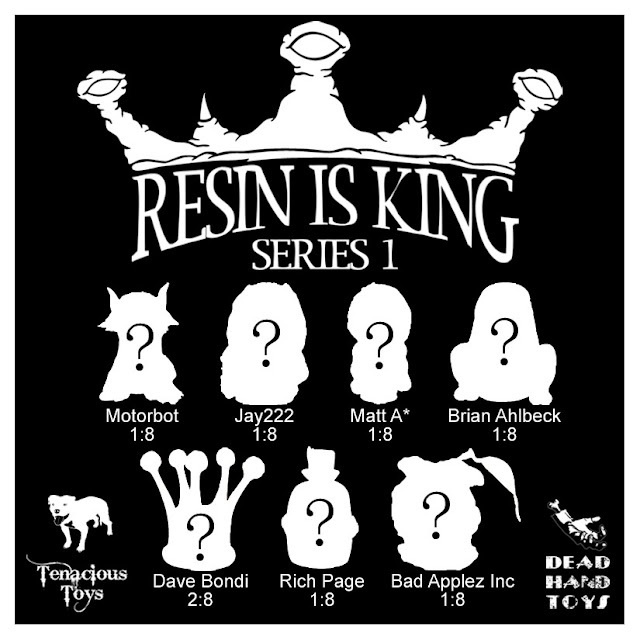 Resin is King Series 1 blind boxes will be $25 each. We have 20 new, unique colorways of Scott Kinnebrew's 4-inch rtesin Buddha Fett figures in stock! Click here to see them all, along with Scott's other customs. 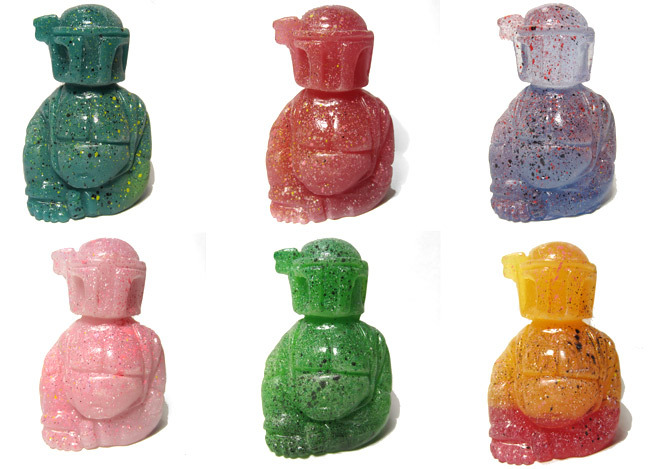 Buddha Fetts are 20 each. 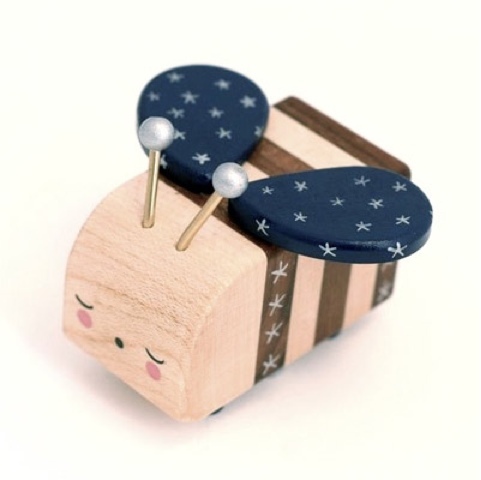 These hand carved wooden bees, aptly names WOODBEES, were created by Pepe in Switzerland out of maple & walnut wood and then shipped over to Lunabee to paint up. There are 10 bees in total - 9 smaller worker bees (approx 2.5 inches in length) and one large Queen bee (approx 3.5"). The worker bees will be up for $99 each and the Queen for $149. These are the only bees that are being made - there will be no future series, it's a one off collaboration and so this is the only chance to grab one of these wooden delights. The release is being split into two with 5 worker bees being released tomorrow Thursday the 10th May at 7pm London time on Lunabees store (http://lunabee.co.uk) and the remaining 4 worker bees and the Queen being released on Thursday the 17th May at the same time and in the same place. 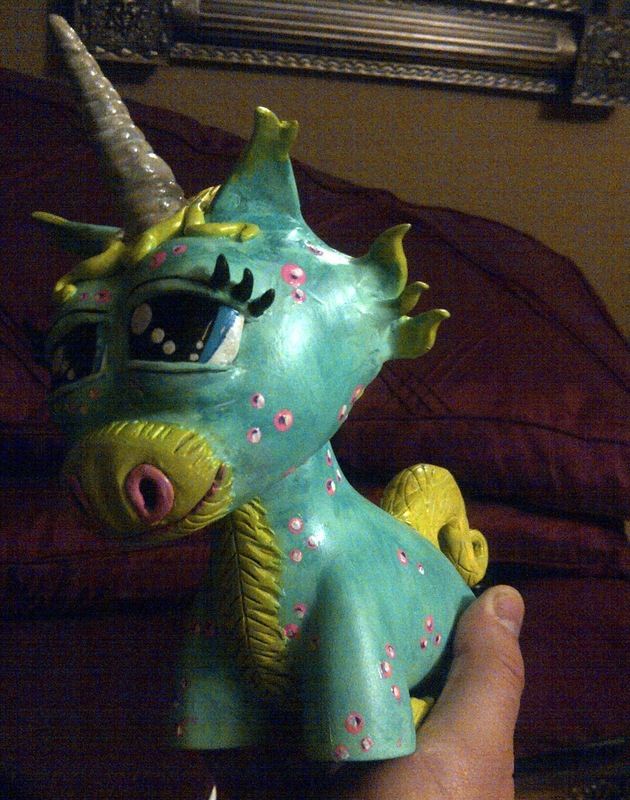 With Kidrobot's release of the new 7-inch Munnyworld platforms, Scott Kinnebrew of Forces of Dorkness got a much bigger platform to work on for his Raffy Unicorn customs! This custom he's holding is literally the first 7-inch Raffy we unboxed and shipped out, and the first completed custom on this platform we saw. You can check out more of Scott's work on our website here. Look for much, much more from Scott in the near future! 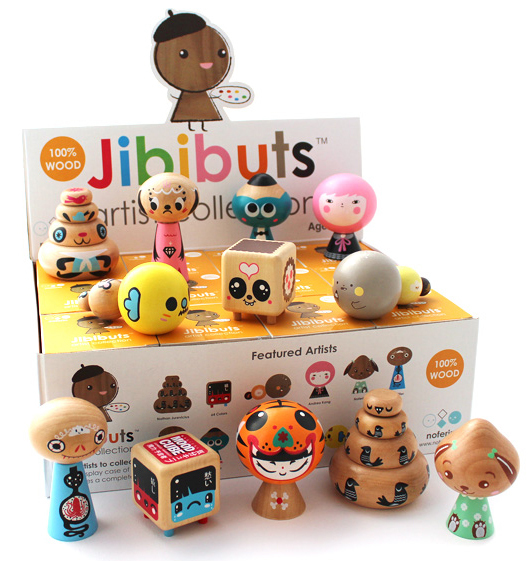 Jibibuts Artist Series wooden blind box figures by Noferin are in stock now! Currently we are selling sealed cases only as they arrived yesterday, but soon we will open some up to sell open-box at reasonable prices. Full cases of 12 pieces contain one of each of the 12 designs- a full, complete set in each case! No chasing rare colorways! I like that. This series contains pieces with artwork by some of our favorite artists: Andrea Kang, Anna Chambers, Bubi Au Yeung, Buff Monster, Leo Hillier, Martin Hsu, 64 Colors, Nathan Jurevicius, Noferin, Peskimo, Squink and Tado. Click here to buy Jibibuts. Domo Qee Series 4 blind boxes have just arrived! Currently we're selling full cases of 15 in our Domo section, but as soon as we get a free minute, we will open some up and sell them open-box. Ask around; we always offer VERY reasonable pricing, even on rare colorways. This is our free custom giveaway! All you have to do is like our page and share this photo! On 21-05 we will randomly choose a winner! Note for confused newbies: there is nothing currently for sale in the 3A web shop. This is not a mistake. 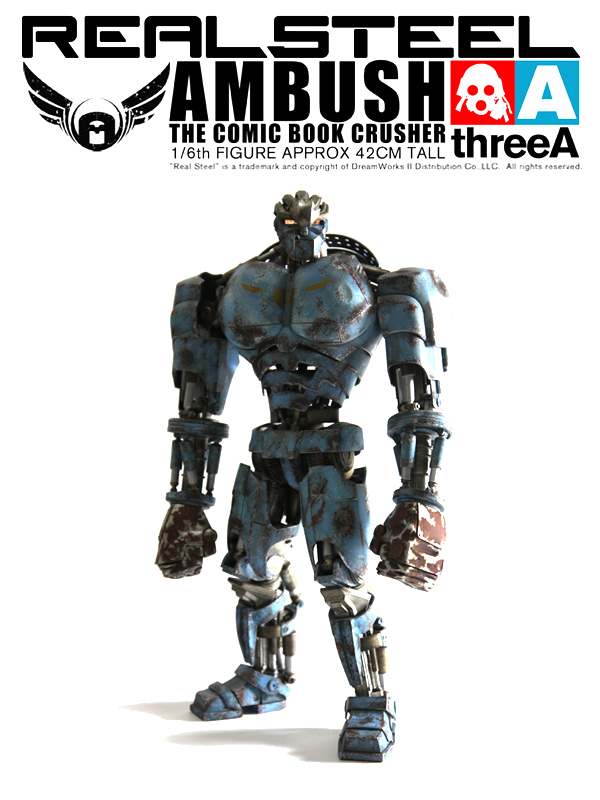 Literally everything 3A makes sells out right away. We recommend signing up for their VOX newsletter to stay informed. Our ex-pat buddy Jon Malmstedt (Rampage Toys) now lives in Tokyo. A while back he was fortunate to be able to visit Japanese paint master Gotto-san, and he made this blog post and this video about his visit. 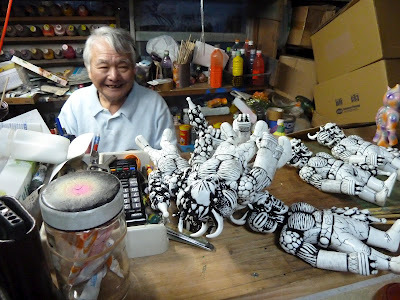 Really, super cool to be able to see "behind the scenes" in the production of sofubi. 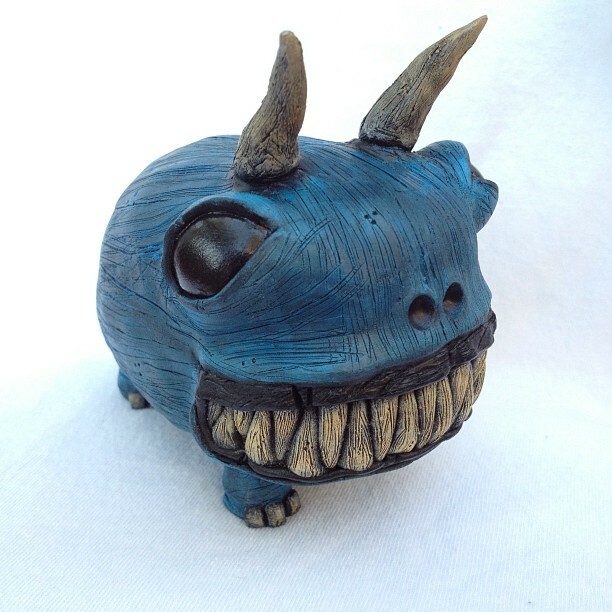 Dave Webb (aka Davemarkart) created this sweet little blue evil thing... whether he knew it or not, he was creating his version of our little blue pitbull logo (below). He wanted to make us a present for helping him out, so he asked us what we wanted. We told him to make us something blue and wicked... and this perfect little monster is what he came up with! A damn fine addition to the official Tenacious Toys collection. Great work Dave! A thousand thank-yous!!! We just received our emergency restock shipment of Andrew Bell's officially-licensed 3-inch vinyl figure of Google's Android logo. 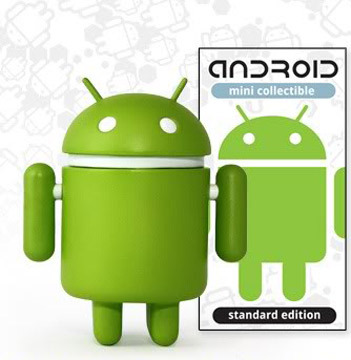 Click here to purchase the Android.